Although therapeutic ultrasound is frequently used in medicine for the insertion of various preparations (phonophoresis), this method of treatment has so far never found any serious application in aesthetic practice. The reason for this is mainly the relatively deep effect of the ultrasound waves that are used. The half of the penetration depth(the distance after which the intensity of the sound reduces to 50% of the value on the skin's surface) for waves with a frequency of 1 MHz, for example, is approx. 3 cm, and it is approx. 1 cm for 3 MHz. For ultrasound waves with a frequency of 10 MHz, this value, on the other hand, is just 0.3 cm approx., which makes its use in dermatology and aesthetic therapy far more beneficial than other frequencies. 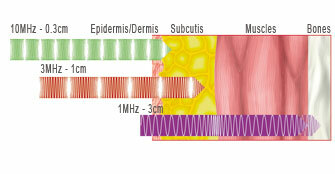 As a result, the effect is mainly concentrated on the epidermis and dermis where ageing processes take place or pathological changes occur (Fig.1). LDM® (Local Dynamic Micromassage) is a special dual-frequency ultrasound technology that combines two different frequencies into a single highly effective LDM® wave, oscillating between the individual frequencies at up to 500 times a second. A dual wave of this type is made up in all devices in the LDM® range of two ultrasound waves with frequencies of 1 and 3 MHz or 3 and 10 MHz (Fig. 2). If the ultrasound frequencies are used in an application as an LDM® wave in combination rather than singly, with identical intensities the absolute pressure values in the tissue remain constant, but the dynamic pressure gradients of the individual frequencies oscillate in line with the frequency change. This opens up the unique possibility of dynamically modulating and strengthening the "massage effect" of the ultrasound. Because cells and individual tissue structures cannot react so quickly to the rapid change, the waves accumulate and act synergistically on the area to be treated. LDM® technology is used mainly for beauty treatments and in the wellness sector for the treatment of cosmetic indications such as wrinkle treatment, skin tightening, anti-ageing, skin blemishes and so on. In the dermatological, aesthetic sector and in pain treatment, on the other hand, LDM®Plus technology plays an important role. 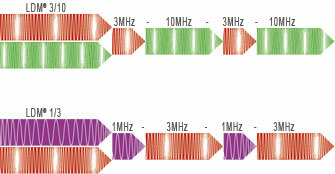 LDM®Plus is a further refinement of LDM® which allows individual ultrasound frequencies to be mixed variably in the LDM® wave for even more individual modulation (Fig. 3). 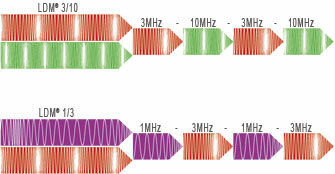 As has already been demonstrated in a wide range of in vitro experiments (over 850) by Wellcomet®, the dual application often has a much stronger effect on cells and tissue: biological effects after the application of both frequencies in one LDM® wave were stronger than the effect achieved by the simple accumulation of individual ultrasound waves with the same frequencies.